Explore the city at night, through a network of galleries, museums, artist run initiatives and undiscovered spaces. The Speed of the Word Sound / The Sound of the Word Speed - MB/MG's first collaborative project. Fundamental to their collaborative work, was the audio performance within the environment of the exhibition. 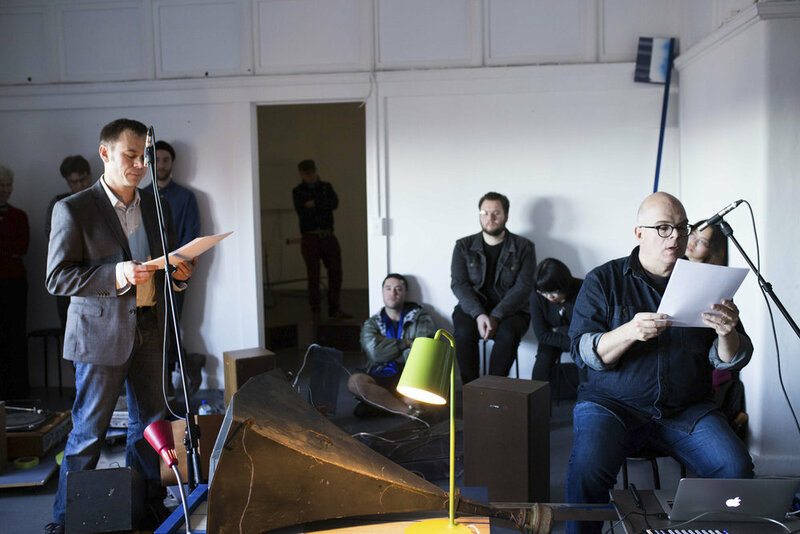 The performance was a conflation of multiple record player improvisations and spoken text works accompanied by collaged recordings produced during their residency at Light Projects. The text invoked an endless cascade of signification, pointing to the circularity of language, amidst a sea of feedback and play of sound generated by the manipulation of the record players. This combination was a deeply suggestive one. The record players were used by MG to signify not recorded sound for which they are originally designed, but the sound of their own ‘suchness’; their own amplified materiality. This experience alongside the spoken word statements, which leapfrog across language and meaning, created a relationship both heavy and light, serious and hypnotic. MG/MB’s work suggested ideas of simultaneity. Could thought enable a thinker to be present in a distant place at the same time as they were thinking in the here and now? My young daughter skipped around a text statement adhered to the floor of the gallery, reading aloud the proposition, that thought can travel distance, can take us into the presence of those we are separated from. Art leaves the viewer/reader freedom to interpret, create, and decipher meaning. I’m much more interested in decoding something than having it presented in a way that makes immediate sense. Writing is a form of drawing and drawing is a form of writing. We are taught to draw letters and words. It is still drawing, even if we are doing this thing we call writing. Language is a form of transportable communicable object or portable sculpture. Language describes as well as creates, changes matter (at least in our minds), and creates circumstances. It is an odd material. I remember sitting on a bench after a studio visit with him and trying to talk through his work. He was very patient with me. I think he was bemused at the dissonance his work produced in my mind. His album-less, or media absent, turntable work upended my thinking about sound and what a person could do and make. He was one of the first artists that I encountered who was engaged with the reality of the turntable as not only a mechanism of playback but most importantly a medium in itself, mechanical/physical/electrical object capable of producing its own voice, apart from what it was typically encouraged to "recite." My visual work serves as a meditative activity, a gestural activity, to access language through body movement, and my language in turn to serve as a kind of armature to reveal the voice of the performer or speaker. The work (sound and writing), in a way, is less important to the particular way individuals who are performing the work are revealed through their participation in the work. Language is perhaps the only true magic that humans possess. The fact that a painting can be a squishy line of one color meeting another color, and that color against color, is the subject and content of the work is still foreign to me. To take a painting and have it serve as a stencil to make a stripe, and have that first stencil painting be marked with the second, and vice versa, is refreshingly direct. I want that freedom. When I see a painting, I see a window, or a screen with “something” inside it. I think I’m somewhat trapped between the shore and the sea. I think Michael has always been, for as long as I’ve known him, in the sea. I think Michael understands painting as an engagement with material rather than image (or in conjunction with an image). Michael sees paint on paint and the rhythm of paintings/colors next to each other. I love working with Michael because my understanding of what I do opens up considerably. I see new possibilities in my work, or viewing work. Michael and I both teach. As a professor I never want to feel like a dinosaur. I don’t want to be stuck in a specific era of art thought, I like my own assumptions and understandings to be challenged and replaced by better understandings. Michael’s work and methods do this for me. Work is best experienced on site and in space. My work is not represented accurately by recording media because so much of the physical space that I am using as part of the instrument is gone in recordings, and the spatial experience of the equipment, sound, architecture is untranslatable. My work has to be experienced. The thing that interests me comes at the moment these relationships between image and sound aren't fixed. Same for a synaesthetic-kind of discourse: when someone hears a weekday, they see a colour, when someone hears a note, they see a colour. I use a sound monochrome and think in compositional terms that for sure it's not far from a painting monochrome. But throw it into installation space, and before you know it you can't work out what is what and where is where and how is how and in what way what is what and is it related to each other or not. It becomes a symphony, a complexity, a composite, a relation and unrelation, ah, a conjunctive and disjunctive relation (William James said so about experience), an awkward relation, a failure of logic, but not in turn or resultantly a failure of sense, sensibility, sensing, the felt etc, but maybe even an emphasis on it? NOTE: Texts (47) and (52) and (59) have been omitted from the BLINDSIDE installation. WOULD WE HEAR THE NIGHT SKY BY LISTENING THROUGH A WELL IN THE DAYTIME? Circle and Hexagon collaborate on installations, installations that include sound art, performance, fixed and live sound, paintings, and texts. Both artists have individual art practices based in Melbourne and Chicago respectively but meet. Circle and Hexagon’s first collaborative installation, The Speed of the Word Sound / The Sound of the Word Speed, was at Light Projects in Northcote. Six years on now, I remember the labour of The Speed of the Word Sound / The Sound of the Word Speed; the painting process, many hands hand-cutting letters and words, and in particular airbrush flourishes sprayed across the gallery walls and windows. The exhibition entitled The Speed of the Word Sound / The Sound of the Word Speed seemed encapsulated in these gestures. Because of course a million decisions in the past end up framing the now. And the past qualifies the present, and so it's hard to even imagine that had we had other choices and times and histories and locations and contexts: that we might have chosen other paths. Yet we're constantly thinking about creating work that has an aliveness, a present-ness, an awkwardness that holds us in a now, today, here, at this time. The holding is somewhat important, the awkwardness even more so. When we are held, we are cared for. When we are awkward, even more so. For when we know, we can move on. Doubly important then that we don't know (for otherwise, maybe, we’d already have moved on, in which case we’d even not be here, now, presently)? Integral to the The Speed of the Word Sound / The Sound of the Word Speed exhibition, and fundamental to their collaborative work, was the audio performance within the environment of the exhibition. The performance was a conflation of multiple record player kinetic acoustics and spoken text works accompanied by collaged recordings produced during their installation residency at Light Projects. The text invoked an endless cascade of signification, pointing to the circularity of language, amidst Michael’s sea of feedback and play of sound generated by the record players. This combination was a deeply suggestive one. The record players were used by Michael to signify not recorded sound for which they are originally designed, but the sound of their own ‘suchness’; their own amplified materiality. This experience alongside Mark Booth’s spoken word statements, which leapfrog across language and meaning, created a relationship both heavy and light, serious and hypnotic. Circle and Hexagon’s texts suggested ideas of simultaneity which I found fascinating. Could thought enable a thinker to be present in a distant place at the same time as they were thinking in the here and now? My young daughter skipped around a text statement adhered to the floor of the gallery, reading aloud the proposition, that thought can travel distance, can take us into the presence of those we are separated from. They both worked around the clock, treating Light Projects as a painting studio, recording studio, and an art laboratory – creating an environment for how two particular people might collaborate. The artistic conversation was focused and playful, with humour and openness overcoming any protocols that either had bought to the collaboration. Their second project was for Bruce Mowson's A Transcendental Fissure In The Immanent Fabric Of Things, which is a title still more awkward than The Speed of the Word Sound / The Sound of the Word Speed. Their project at Blindside is a vehicle, a context, for the artists to continue dialog or conversation or communication. And the title got more complex again. Their next project title will be incomprehensible. The narration of the rational is not the same as the rationale of the narrative, and so reading forwards and backwards across Mark Booth art in simple movements of letters functions like sightseeing, especially thank you to vertiginous surprises. Similarly the placement of image with text, text with image, abstraction with statement, statement with abstraction. Subject to direction, the signal changes, and subject to the signal, the subject changes. Thus likewise, when there is no subject, then the signal sings. Some call it formalism, yet once you’ve got two monochromes, it’s not the same anymore, the essential premise of a unique one only with never anything else all on its own-ness is quickly suffused. Relations again. The abstract mark with the word and the abstract work with the abstract render both more and less sensible. Bothness ensues. Language is central to my thinking. Maybe speech more than text. I’m obsessed with the voice and with people speaking. Even my two-dimensional text work is ultimately about speaking or employs the conventions of a speaking voice or voices. Sometimes as dialog set against dialog from unattributed speakers, or sometimes the unconnected thoughts of many minds thinking simultaneously in a single moment. Language is the common thread between the various media and disciplines I employ in my work. My writing appears in my paintings and drawings, sound works, and performance works. I’m not a fiction writer though, I’m more of a poet, but mostly an artist who uses words instead of representational visual images. Or have more of a poet’s sensibilities in relation to a singular solitary idea or moment that would likely not depend on hundreds of pages of semi-linear chronological narrative. Poetry has the possibility of talking about a single moment with concision or a group of related moments but leaves the reader more freedom to interpret, create, and decipher meaning. For me, there is more. I’m much more interested in decoding something than having it presented in a way that makes immediate sense (to me or anybody else). I think something that gets ignored or forgotten or remains unconsidered is that writing is a form of drawing and drawing is a form of writing. We are taught to draw letters and words. It is writing but it is still drawing, even if we are doing this thing we call writing. Maybe speaking is a form of writing. I’m really interested in language as a form of transportable and communicable object or portable sculpture. A form that enables the artist/poet to move, organize, make-chimera, splice objects in their mind, your mind, and in the mind of someone who encounters your language-sculpture. I think more about the five lines in a poem than I do with the 60,000 words of a novel. Language describes as well as creates, changes matter (at least in our minds), and creates circumstances. It is an odd material. Written language is a little opaque to me sometimes, because of my dyslexia. I like language in the ear. I’m an ear person. Lists, darn, they list and list. If it wasn’t for returns and spaces and spacings and layerings one after another but even more on top of another and then with colons and dashes and sometimes slashes and if not sorted in outlines but in progressions of ideas then what narratives would we be left with if they didn’t somehow start to form into successions of things that were stopped along the way. Stopped along the way! Stopped along the way? Yet there is no beauty more than the collision of word and voice pushing against another, or of the collision of concept against concept. All the more so when they are of incongruous nature, shattering against another, pushing from side to side, rubbing at their edges. Were it surrealism, it would be lugubrious, yet absurdity plays more deadpan, Mark Booth plays more distant. If concerned about language, it would be about determinism. If concerned about the saying of things, it would be about stating. If concerned about meaning, it would be about too much or too clear. No danger of these with Mark’s collisions. Thus his is a word space I’ll fall into at pleasure, an incongruity where each turn of the thought takes me with it alongside as will an onrushing cloud. (Thank you Andrea Belfi, David Grubbs, Stefano Pilia). Language belongs to everyone. Some people declare themselves to be experts or are declared experts, and make proclamations or judgements about what is good writing or proper writing, or proper thoughts, or well-formed thoughts, but everyone’s voice is important. No one owns language. Everyone is free to change it. It is our universal instrument. I’m interested in poetry, more than fiction. I appreciate the terse, more abstract possibilities of poetic language. The pleasure of my personal engagement or discovery of the semi-encoded. Language of poetics. Poetry seems to reveal its material and present its meaning at the same time. In an earlier question, you asked about silence: I love silence. Or in other words, a place to listen both outside and inside focused quiet is very powerful. I know I said before that I’m not overly interested in my visual work – that is not exactly true. The visual is important to me as a counter vocabulary to the connotative/representational nature of text (this counts for sound as well). I love looking/making/drawing lines/ geometric shapes/and structures/sounds which are from a different universe than words. Words can be sounds but sounds can be sounds. Images can be words but words can be words. Shapes can be words but shapes can be shapes. Wordlessness is important as well. And silence. It is 7:28pm in Oak Park, a suburb of Chicago, and for approximately three mysterious minutes, at dusk, what sound like hundreds of birds, call out invisibly from within the arborvitae. Just as miraculously, with the departure of the sun, their din, which arose from quiet, falls into an equally mysterious quiet interrupted occasionally by a single avian voice. It is as if a needle were placed upon a vinyl recording, allowed to play, and lifted again. An “off sound, on sound, off sound” experience. Post-birds, the backyard exists for me in a newly changed silence, an experience not unlike perceiving the work of Michael Graeve. Graeve’s artwork, reminds me how to see (as well as hear). Some art, much painting, is representational, strives for illusionary depth, and operates like a window through the gallery wall onto another vista. Graeve’s work, on the other hand, exists in a space reminiscent of a scene in which the gallery window has been spray painted opaque or saturated by a paint roller. No more possibility of illusion. No more artificial window. No more possibility of seeing something “elsewhere.” Only the option of seeing and hearing “here.” The viewer is confronted with the optical material of paint, the layer, the surface of the painting ground, and the wall, the visible evidence of process. Like-wise the listener is confronted with the concrete material of Graeve’s sound, the mechanism of the sound’s playback, and often the means of its production. The work asks and urges the perceiver, through a radical concretism, to remain rooted in the present. Graeve’s work suggests “what is” rather than “what could be.” To be re-tuned to “what is” is a great achievement. I think Michael’s work and working practice are radical. He is a very generous, playful, yet serious artist. His work demonstrates to me a long term very formed and considered aesthetic. When I first met Michael in Chicago his practice seemed fully developed. I remember sitting on a bench with him in a park across from the art institute of Chicago after a studio visit with him and trying to talk through his work. He was very patient with me, as I think he is with everyone. I think he was bemused at the dissonance his work produced in my mind. His album-less, or media absent, turntable work upended my thinking about sound and what a person could do and make. He was one of the first artists that I encountered who was engaged with the reality of the turntable as not only a mechanism of playback but most importantly a medium in itself, a mechanical/physical/electrical object capable of producing its own voice, apart from what it was typically encouraged to play back. Performance has always been an essential component in my work. I’m not overly interested in my visual work – even though I’m trained as a printmaker and painter, other than it serving as a means to quiet my mind and allow me to be in a form of generative meditation – in which my imagination can explore and allow me access to free-floating phrases and verbal images. Drawing serves as a remover of obstructive mental filters. It is a practice in the body. The activation of speech through performance is very critical to my practice. My visual work serves as a meditative activity, a gestural activity, to access language through body movement, and my language in turn to serve as a kind of armature to reveal the voice of the performer or speaker. The work (sound and writing), in a way, is less important to the particular way individuals who are performing the work are revealed through their participation in the work. Language is perhaps the only true magic that humans possess. Enunciation and pronunciation in a body modulate meaning. Michael’s approach to painting is very radical as well. The fact that a painting can be a squishy line of one color meeting another color, and that color against color, is the subject and content of the work is still foreign to me. To take a painting and have it serve as a stencil to make a stripe, and have that first stencil painting be marked with the second, and vice versa, is refreshingly direct. I want that freedom. When I see a painting, I see a window, or a screen with “something” inside it. I think I’m somewhat trapped between the shore and the sea. I think Michael has always been, for as long as I’ve known him, in the sea. I think Michael understands painting as an engagement with material rather than image (or in conjunction with an image). Michael sees paint on paint and the rhythm of paintings/colors next to each other. I love working with Michael because my understanding of what I do opens up considerably. I see new possibilities in my work, or viewing work. Michael and I both teach. As a professor I never want to feel like a dinosaur. I don’t want to be stuck in a specific era of art thought, I like my own assumptions and understandings to be challenged and replaced by better understandings. Michael’s work and methods do this for me. I love playing what I call my instrument (which is in actuality a constellation of turntables, amps, and loudspeakers which I all an orchestra) because my work is best experienced on site and in space. My work is not represented accurately by recording media because so much of the physical space that I am using as part of the instrument is gone in recordings, and the spatial experience of the equipment, sound, architecture is untranslatable. My work has to be experienced. This limits, but also liberates. Music affected me long before painting did, but when painting did affect me, it was with colours and shapes. For example, at either 15 or 16 I had an oil colour set, and after executing two dismal copies of windsurfing posters, one of my next works was a copy of Willem de Kooning's work, I think Yellow River (1958). Lots of yellow and blue fighting. Even in music I often had a bias against stories for as long as I can remember. (insert text here to reference to pressing stop on cassette when vocals arrived in song). Hence my awkward relationship to pop (I'll have to remember this when thinking below about what my relation to writing is, then, or literary ideas, and why I might so respond to Mark Booth's writings, in their non-narrational exuberance. Should the brackets remain open, or closed? The brackets in the title remain open, that much is important. I was going to mention space, above, when I wrote about sound and colour. I’m rather fond of it, too. I’m rather of it, too. Looking for an originary mythical moment, I go back to my mid-teens, around age 14 affected by sound space in music. And that moment should then make me listening for an originary mythical moment, I hear back to my mid-teens, around age 14 affected by sound space in music. It's the closest I’d say I've felt to have come to a synaesthetic kind of cross-modal overlapping “this thing here causing that feeling there” experience. The first time it hit me was hearing of the Art Ensemble of Chicago with a radio. Compression and release and ensemble and freedom and endless columns and Brancusi and Hans Koller and Cecil Taylor and control and open enough now so much so that mentioning isn’t the same as writing. Thank you to Alina and Annika Graeve for your voices, Polly Stanton for gold mine expeditions and special thanks to Elissa Sadgrove and Cathleen Odell and the BLINDSIDE team. Mark Booth is an interdisciplinary artist. His work in language, image, and sound explores the tensions between imagination, observation, description, invention and error. Booth teaches creative writing and sound art at the School of the Art Institute of Chicago. He received a BFA from the Rhode Island School of Design and an MFA from the School of the Art Institute of Chicago. He has exhibited, played, and performed his work in a variety of established and obscure venues. Michael Graeve is a Melbourne visual and sound artist, exhibiting and performing internationally. He works across painting and sound through easel painting, site-specific installation, painting and sound installation, sound performance and composition. Michael is committed to artist-run culture, being chair of Liquid Architecture since 2011, and previously as board member and program manager at West Space and as founding member of Grey Area Art Space. Michael lectures at RMIT University in Sound, Sculpture, Expanded Studio Practice and in the Master of Fine Arts program. He was a Samstag scholar, and held the Australia Council ISCP studio in 2005. Images | Mark Booth and Michael Graeve, (6) THE SPEED OF THE WORD SOUND. 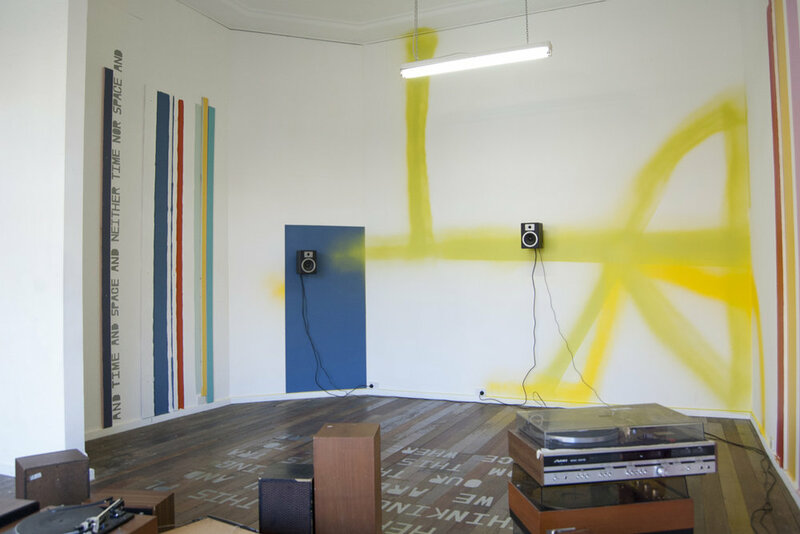 THE SOUND OF THE WORD SPEED (installation view, Light Projects, Northcote), 2011, installation, dimensions variable. Photo Michael Graeve | Mark Booth and Michael Graeve, (6) THE SPEED OF THE WORD SOUND. THE SOUND OF THE WORD SPEED (performance, Light Projects, Northcote), 2011. Courtesy the artists.